First and foremost, thanks to the people at Gollancz and author Michael J. 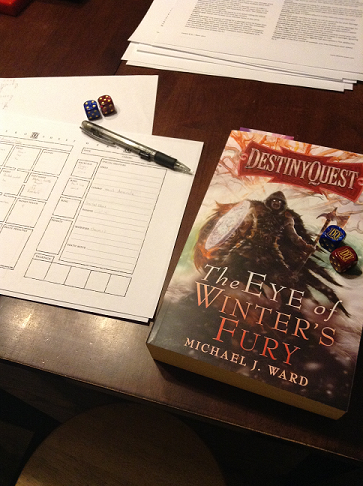 Ward for a slightly advanced copy of Destiny Quest: The Eye of Winter’s Fury. I say slightly because of the travel time “across the pond”. The book came out last Thursday, I just got it a week later. BUT! That won’t stop me from doing a slight preview and review (when I’m done). I also had an unexpected surprise with a copy of Tithe of the Saviours by A J Dalton. Look for a review of it as well. So, how does The Eye of Winter’s Fury stack up? So far, it looks like it may be the best of the series. And I’m only through the Prologue. And what a Prologue it is. It’s a whole quest unto itself, as compared to a large section in the previous books. I’ve run into one puzzle, a number of combats to ease readers into the story and the rules, and one heck of a twist. The heroes in the Destiny Quest series have hard lives, and this one will be no different. So, if you are a fan of The Legion of Shadow and The Heart of Fire, you will want to pick this up. This entry was posted in DestinyQuest and tagged destiny quest, destinyquest, preview by Brian. Bookmark the permalink.